Here’s a business paradox: Kindness breeds organizational success. It’s a paradox because when we think about how to optimize creativity, productivity, and other metrics of high performing organizations, compassion rarely enters the conversation. We talk instead about more tangible metrics: things like increasing efficiency, billable hours, sales numbers, and other more quantifiable measures. But leading firms are beginning to learn that compassion plays a powerful role in driving successful business outcomes (further detailed in my book, Start Here). Just think about what happens when the opposite of compassion becomes the norm in an organization. Without compassion, feelings of irritation, reactivity, anger, and defensiveness become the norm. And this leads to near constant emotional drama, suspicion, turf wars, and chronic stress. The problem, of course, is that this kind of corporate atmosphere isn’t just bad for the mental and emotional health of employees. It’s bad for business. As anyone who has ever been a part of a work culture like this knows, all of this emotional drama consumes a massive amount of mental and emotional energy. When you feel betrayed by your co-worker or worried that your boss doesn’t respect you, it can be really hard to stay focused on the tasks that need to get done. Compassion, however, creates a different kind of corporate culture. When we approach our work with kindness instead of defensiveness, we experience greater empathy and curiosity. 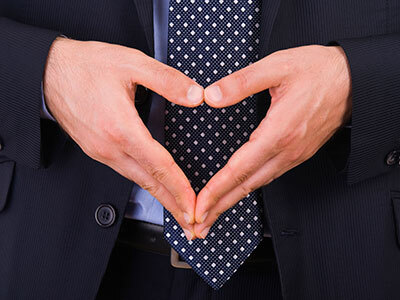 It’s clear that compassion can radically shift the culture of a company in ways that lead to optimal performance both on the individual and organizational level. So how can you bring compassion into your workplace? Here are a few simple first steps. The tip is simple and yet has the power to change your day and the day of everyone you come into contact with. It comes from the Dalai Lama. When visiting the U.S., he used to imagine everyone he met was old friend. You can use this practice as you go through each day at work. Each day, after all, you probably encounter numerous people: the people on your team, the people in the elevator, the people you interact with over the phone. The tip here is to shift the way you interact with these people. In each of these encounters, imagine you really were meeting an old friend for the first time in a long time. Imagine how excited you would be to see them. This simple shift in your mindset will change the way you interact with everyone you encounter. It may light up your face with a smile. It may lead you to say “thank you” with greater depth and sincerity. And it may also change the experience of everyone you come into contact with. This one genuine moment of human connection might just make their day. The Reason We’re All So Distracted? Mind Wandering from LIFE XT on Vimeo. When it comes to compassion, walking into the office in the morning is a key moment. If you feel irritated and rushed, you’re likely to be anything but kind to the next few people you see and the rest of your day will tend to follow a similar pattern. So see if you can use walking into work as a cue to help you build the habit of feeling compassion. As you get off the elevator, walk through the front door, or open your computer, make a habit of shifting your attention to compassion. All you have to do here is think of all the people you will interact with during the day and say to yourself, “May you be happy and at peace.” You can even put a sticky note on your desk or computer to help you remember. One of the best ways to be more compassionate at work is to catch yourself whenever you slip into irritation or defensiveness. During the course of a day or a week this is bound to happen. The key is to become aware of it. Without awareness, after all, you tend to react – to say something you don’t mean or become overly defensive. The tip here is simple. When you feel yourself in this reactive mode, stop and take a single breath. Breath in for four counts and out for four counts. Then decide what to say or how to reply to the email that just triggered you. This small space opens the door to a more compassionate, less reactive, way of responding to intense workplace situations. These are the things you can do today to bring a spirit of compassion into your workplace. As you will soon see, this shift is contagious. The more you shift your state of mind to kindness, the more you will experience others doing the same. It’s a shift that improves your wellbeing, the wellbeing of others, and the productivity and efficiency of the entire organization. Imagine being less stressed, more focused, and happier every day of your life. Start Here outlines a program designed to help you do just that by cross-training the skill of lifelong wellbeing.If given the choice, we would all choose to be less stressed, to feel happier, and to experience a more optimal state of wellbeing. So why are these outcomes so hard to achieve? The answer is quite simple. No one has taught us how. It turns out that just as you train your body for fitness, you can train your mind for wellbeing. We call this Life Cross Training (LIFE XT), and Start Here is the manual for anyone seeking to achieve emotional fitness. Combining ancient wisdom with modern neuroscience from the world’s leading experts, LIFE XT is a groundbreaking training program to master the art of wellbeing. The program teaches practices proven to rewire the brain for increased focus, engagement, and resilience to stress. By offering specific practices, habits, and assessments to manage your training and by helping to build up core skills such as mindfulness, gratitude, and compassion, authors Eric Langshur and Nate Klemp lay out a thorough and sustainable program that anyone can integrate into their daily lives. 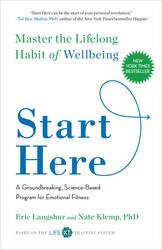 With Start Here, you will: -Feel less anxious, distracted, and overwhelmed, and more focused -Increase your productivity -Feel a stronger sense of meaning and contribution -Build stronger relationships with family, friends, and coworkers These are benefits we all seek and can all experience by cross-training with the scientifically validated practices presented in this book. Want to become less stressed, more emotionally fulfilled, and more in harmony with the world that surrounds you? Start here. Nate Klemp, PhD is the co-author, along with Eric Langshur, of Start Here: Master the Lifelong Habit of Wellbeing. He is a Stanford-Harvard-Princeton training former philosophy professor and an expert in understanding how the tools of ancient and modern wisdom can be used to improve individual wellbeing.